More and more applications are becoming available that rely on the OGC Sensor Web Enablement (SWE) framework for integrating sensors and their measurements into spatial data infrastructures. While functionality allowing the access to sensor data, the tasking of sensors and the alerting based on measured values is already available through the OGC SWE architecture, an approach for discovering sensors, sensor data, and Sensor Web services is missing. 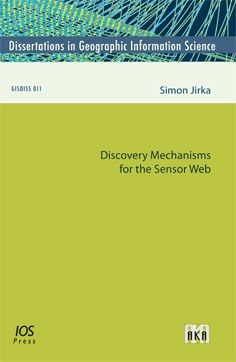 Based on requirements derived from different research and application contexts this book closes this gap by offering a conceptual framework for discovery within the Sensor Web. The results described in this book comprise a concept and implementation of a Sensor Web discovery service, the design of metadata models for describing resources in the Sensor Web as well as an approach how to automatically collect and process metadata from Sensor Web services. In addition, a mechanism is introduced how the Sensor Web world and the OGC Catalog, as a core element of spatial data infrastructures, can be coupled. Finally, this book offers a concept for integrating the semantics of phenomena observed by sensors (the observed properties) into the discovery process. In summary, this book offers valuable guidance to all who want to publish sensor data or want to enhance existing SDIs with sensor data.